Beekman Boys Dinner at Terrain: All Hail the Beet Tops! If there is one word that factors prominently in the Beekman Boys’ lexicon, it is community-knowing and growing with one’s neighbors. To gather around tables together. To support each other’s endeavors or to get to know each other more. Hell, it’s to experience this thing called life. Together. Although one recent October evening was warmer than usual, the balmy temps only added to the convivial gathering at Terrain in Westport. 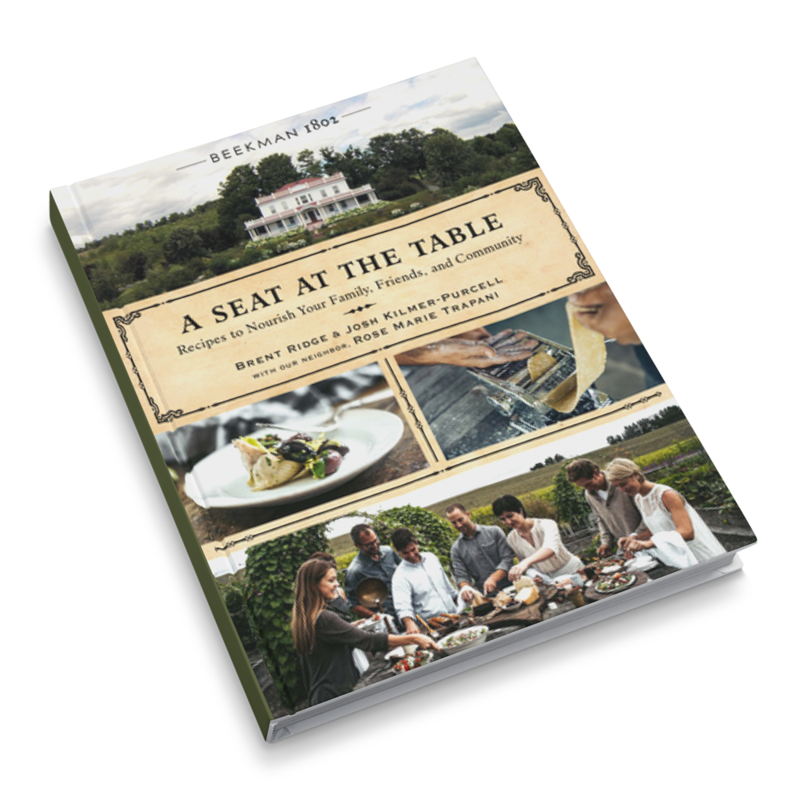 It was a celebratory gathering to mark the new cookbook by Brent Ridge and Josh Kilmer-Purcell, founders of Beekman 1802 lifestyle company. This book, their sixth, sends out the call to “Have a seat!” and enjoy an assortment of dishes that they have created along with their Sicilian neighbor, Rose Marie Trapani. A sampling of these dishes was highlighted this evening. Under a sparkly, lit tent, h’ors d’oeuvres from this collection floated from person to person on wooden tree rounds: Ricotta-Filled Figs wrapped in Prosciutto (pssst…secret ingredient: mini chocolate chips-who knew?) and skewers of Mozzarella, tomatoes, and cucumbers with basil and parsley pesto. The lack of crisp fall air certainly didn’t hinder our enjoyment of the hot apple cider with Bulleit Bourbon. I believe we filled our mason jars twice. If one is having a community dinner, then surely there must be a lonnnng table to seat that community. This one was dressed in natural linens, flickering candles, and seasonal flowers, fruit and grasses, each place setting topped with the evening’s menu. I will be sure to remember branches of persimmons for my next fall gathering. It was a study in comfortable, easy elegance. Do place cards normally fill you with a feeling of dread? Well, the Beekman Boys have all the tricks to get you chatting with your neighbor quickly-these place cards not only included your name, but “seated on your right is: (insert name).” If you are bad with names, there is no excuse now! Talk about an instant introduction. On the menu, we enjoyed Flower Pot Bread (a Terrain specialty) and crispy Sweet Ravioli filled with pumpkin, which were nestled in a puddle of creamy ricotta and honey. All the while, cooking demonstrations from Jessica Bengston, the executive chef at Terrain, and stories by Brent and Josh kept us laughing and talking. As Chef Jess wrapped up demos, plates flowed from the kitchen for each guest and Chicken Breast wrapped in Prosciutto with Red Pepper Gremolata appeared next. Said chicken was sitting atop a bed of what turned out to the the hit of the evening: Beet Greens sautéed with garlic and breadcrumbs. Beet Greens? Beet Greens! We’re pretty sure you have discarded beet greens before, but have you cooked them? If you haven’t, you are missing out. Simply put, they are divine. More delicate than chard or kale, could be a brother to spinach and hey, something different! Use those beets, stem to stern, everyone! Dinner wrapped up with individual Boozy Bundt Cakes. Are those three words wonderful together? Adorable, buttery and, like the Beekman Boys say, filled with “Amaretta” (translation: Amaretto). A large version of these would be perfectly wonderful on a snowy evening; that Amaretta sure would warm the cockles of your soul. This dinner accomplished for me exactly what the Beekman Boys intended: the power of community. I walked away from my seat at the table with not only a belly filled with fine food, but conversations and people I will remember and who I also hope to bump into around town. To the three women with the kooky-aunt-inheritance hats, I’m talking to you and will happily say “Hi Neighbor!”. Note: All recipes are best enjoyed in the company of neighbors.